This composite image, acquired by Envisat’s radar instrument, shows the Danube Delta, Europe’s best preserved river delta. The Danube originates in the Black Forest in Germany as the smaller Brigach and Breg rivers, which converge to form the mighty Danube. Flowing southwest for more than 2800 km, it finally pours into the Black Sea via the delta. Designated a World Natural Heritage Site in 1991, the Danube Delta is a labyrinth of river channels, lakes, bays, floodplains, marsh and reed beds. This vast triangular delta is home to an extremely rich variety of birds, fish, animals and plants. 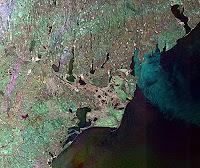 The delta protrudes into the Black Sea owing to the continual deposition of alluvial material – and is continuing to grow seawards at a rate of up to 30 m per year. This magnificent natural reserve lies largely in Romania, which is set to be ESA’s newest Member State. On 20 January 2011, Romania signed the Accession Agreement to the ESA Convention to become the 19th ESA Member State. Later this year, the Government of Romania will conclude the ratification process and once the ratification instrument is deposited with the Government of France, Romania will officially become an ESA Member State. This composite is made up of images acquired on 19 July, 23 August and 27 September 2010 by Envisat’s Advanced Synthetic Aperture Radar.